Earlier this summer I took a tour of an Eastern North Carolina cucumber farm. It was really interesting to learn how the farm works, from preparing the soil, planting, picking, boxing, and shipping out the cucumbers to processors who distribute them to grocers and food waste with the harvest left behind. I was shocked to learn that 25% of cucumbers grown in the US do not reach the consumer because they have an imperfection that doesn’t impact the taste or quality! For example, they aren’t the “right” size, are curved, or have a blemish on the skin. That’s right. Stores won’t buy cucumbers that aren’t straight because consumers see them as ugly! What a waste! According to the Food and Agriculture Organization of the United Nations (FAO) every year, more than one-third of the world’s food is never consumed–approximately 1.3 billion metric tons. 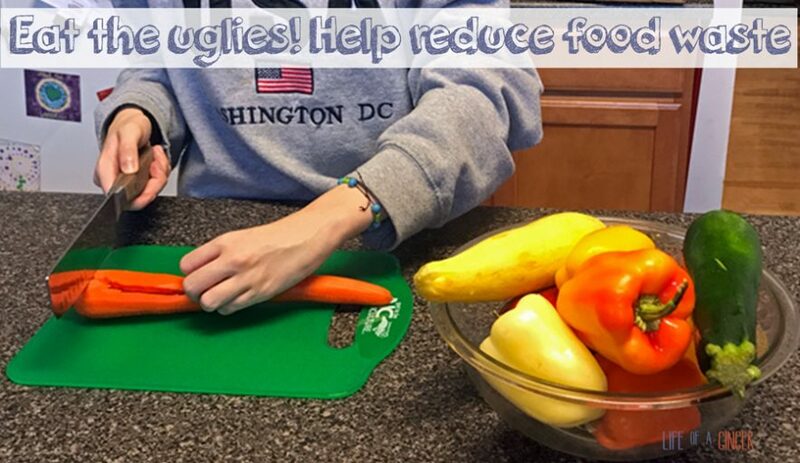 That equals an estimated $1 TRILLION of food loss and waste globally each year (plus decomposing food is a significant contributor to global warming). We ended up using the bulk of our ugly produce for a delicious stir fry that my 11 yo made all by herself! And it was delicious! The beauty of a stir-fry is that you can customize it any way you want. I hate mushrooms and onions so I steer clear of them. I love a spicy kick, but not all of my kids do, so I will add spicy peppers/sriracha sauce to a small portion of the meal. I love to add asparagus, snow peas, and kohlrabi. Heat 1 tablespoon sesame oil in a wok or large sauté pan over a burner set to medium, add the chicken. Brown, but do not fully cook it (about 3 minutes, stirring to brown all sides). Add the carrots to the pan and about 1/3 of the bottle of sauce. Sauté for a few minutes until the carrots begin to soften, then add the peppers. Stir in a bit more sauce, sauté for 2-3 minutes before adding the zucchini and squash (or they will get soggy). Add the rest of the sauce, if desired. Turn up the heat to medium-high and stir-fry for 2-3 minutes, stirring frequently until the chicken is fully cooked and veggies are al dente (or to your liking). If you don’t want to use a store-bought stir-fry sauce you can make your own very easily. Many times I will just toss in some soy sauce, sesame oil, and rice wine vinegar with a splash of sriracha. I might add some Chinese Five Spice (ground cinnamon, cloves, fennel, star anise, Szechuan peppercorns) for a little extra flavor, and if needed, stir in a little cornstarch to thicken the sauce.